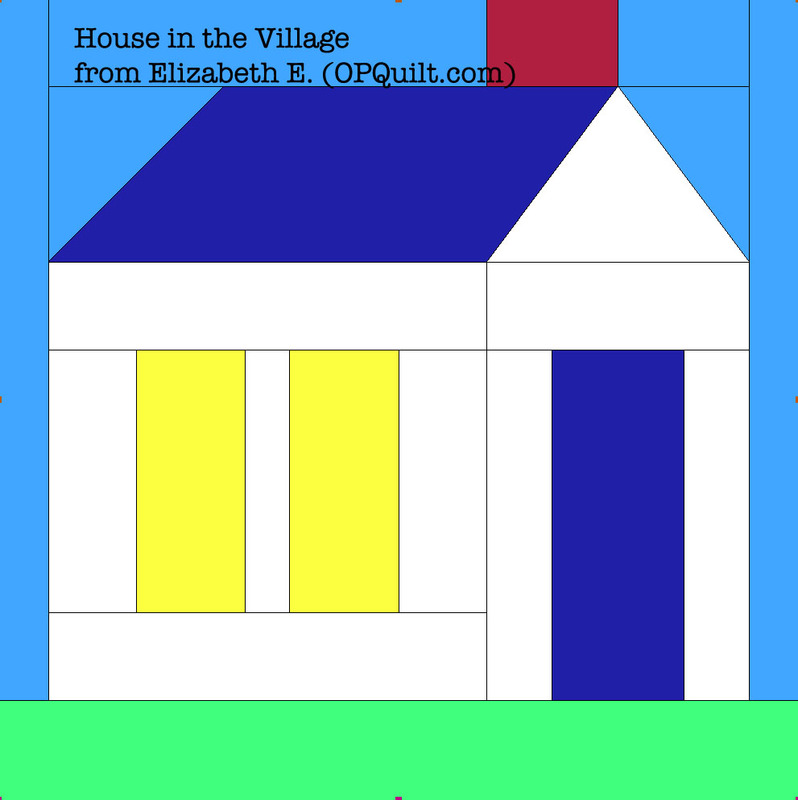 Posted on September 16, 2012 by Elizabeth E.
This is a continuation of what-I’m-calling the Portuguese Tile Quilt, a free quilt pattern from *here. 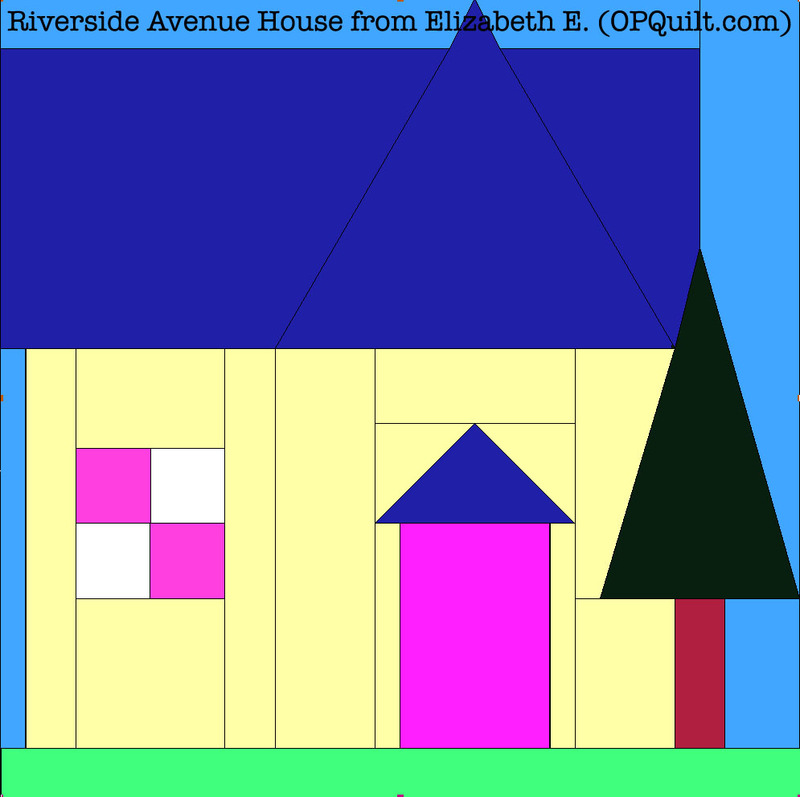 * I arranged my pieces on the board so that no two fabrics were in any block, meaning in the blue quadrants, they were different from each other and the pink quadrants also had fabrics different from each other. 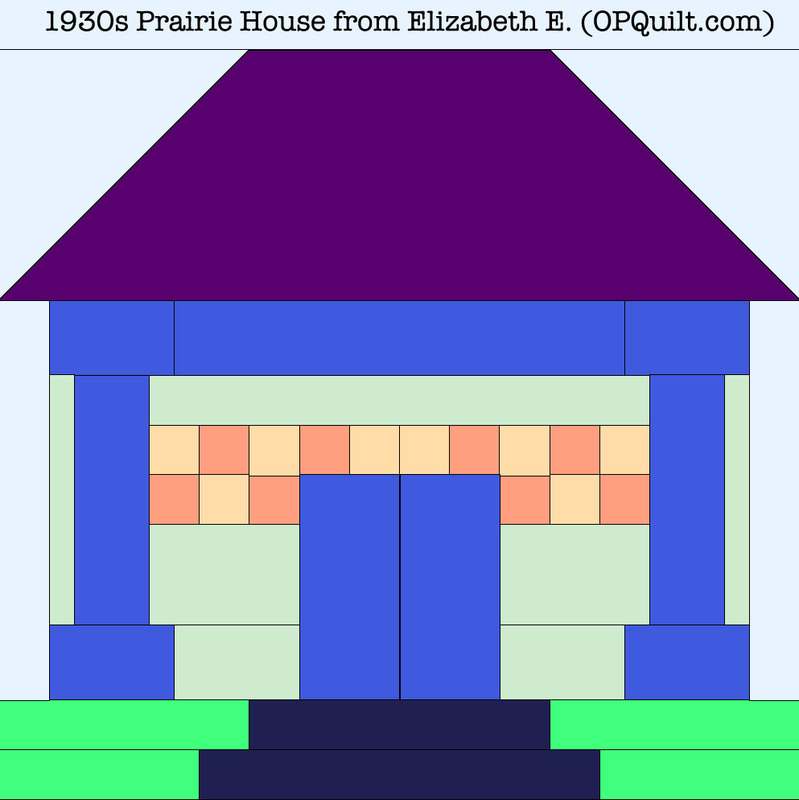 I didn’t care so much if the pinks imitated the blues, but I did watch out for strong fabrics in the same block (like that “plaid”). 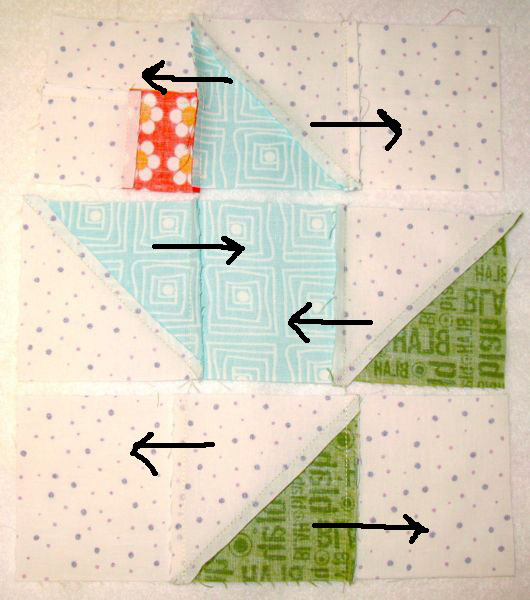 To sew these blocks together, flip the right-hand side of the block onto the left-hand side, then place the top two on the bottom two and stack them on your sewing surface. That’s my confusing method; you’ll probably develop your own. 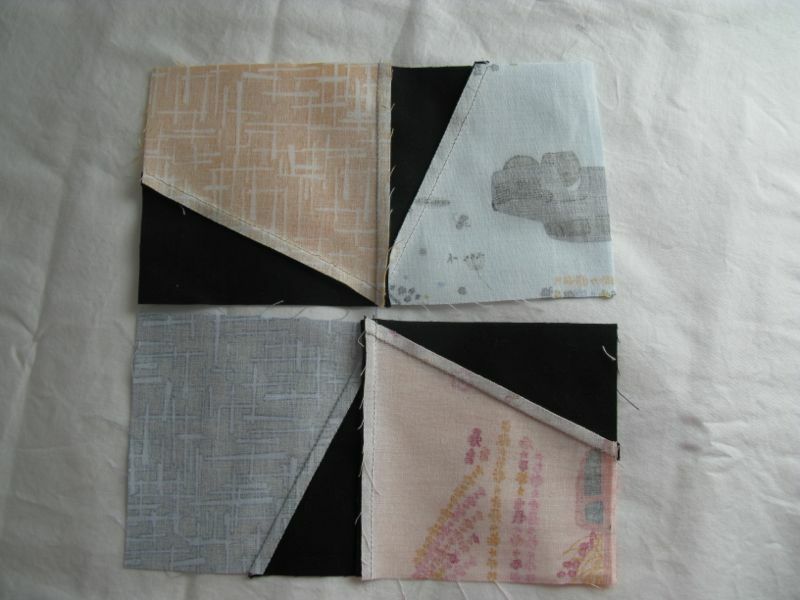 The basic idea is to get the quilt block, which is now in four pieces, over to your sewing machine in some semblance of order. So, on the top, is the right-hand upper piece flipped over on the left-hand upper piece. 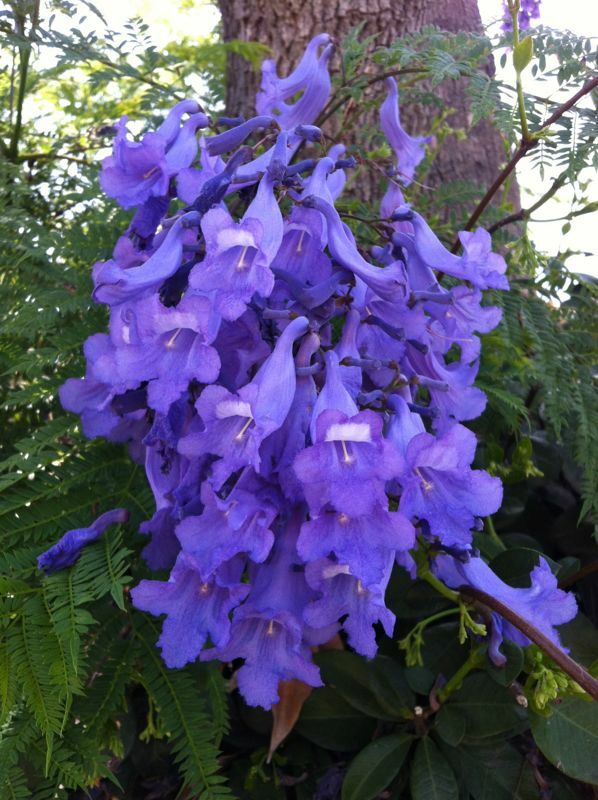 On the left on the bottom, is the similar pair. I have no idea what that other bit is doing–just hanging out? 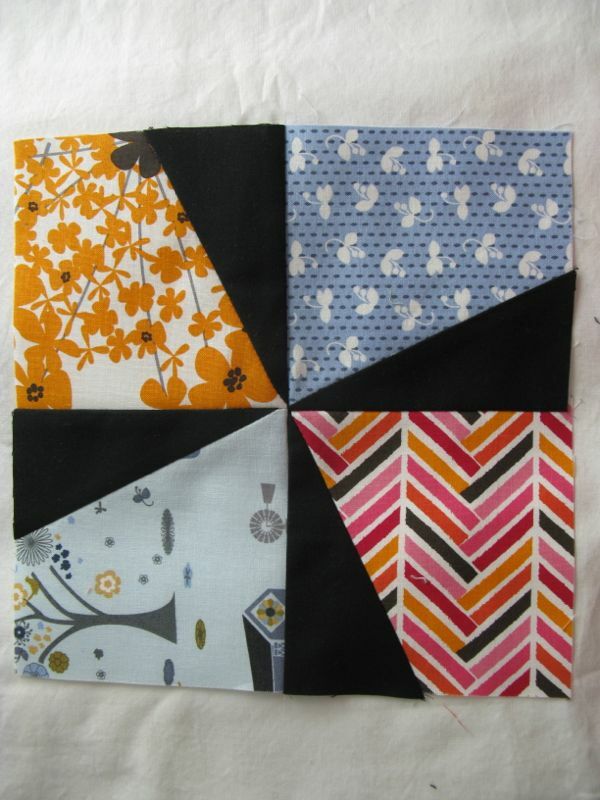 Quilt blocks are buddies and they seem to like to do that. 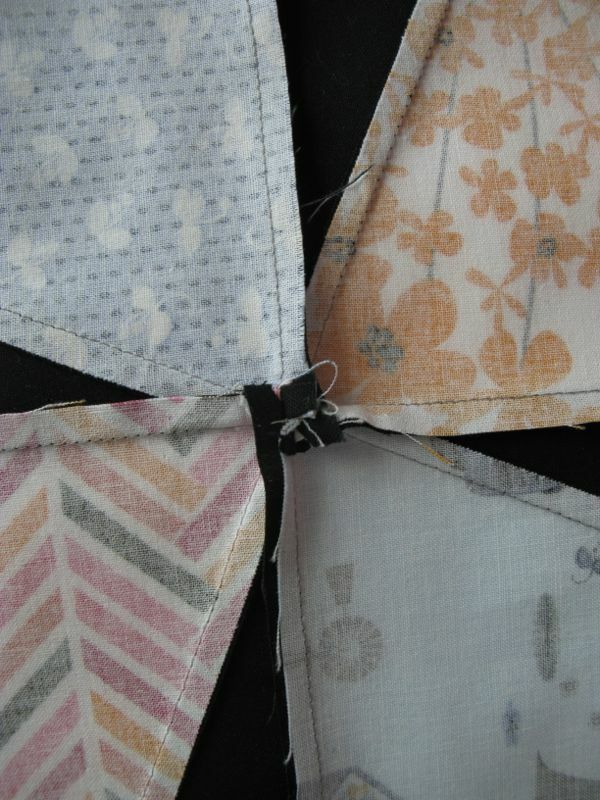 Sew the center seams on those pairs, then press the fabric toward the black pinwheel on all of them. Here’s my little trick. 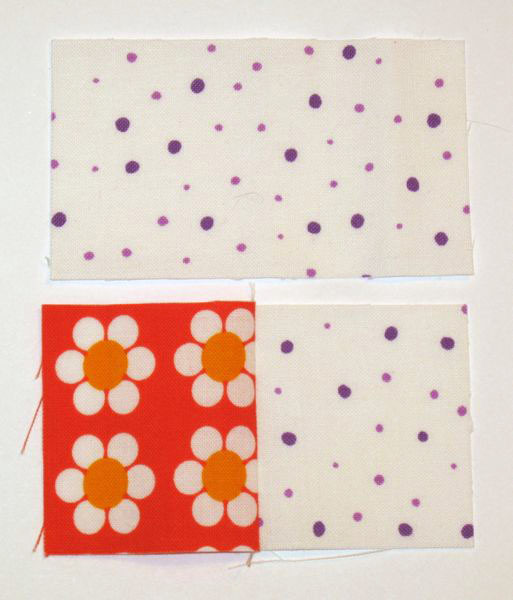 I sewed these pairs in a chain, then left the pairs that went together hooked in the middle, but cut the chain into “two’s.” Then when I go the ironing board, I don’t have to match them all up again. They’re already joined. Flop them right-sides together. 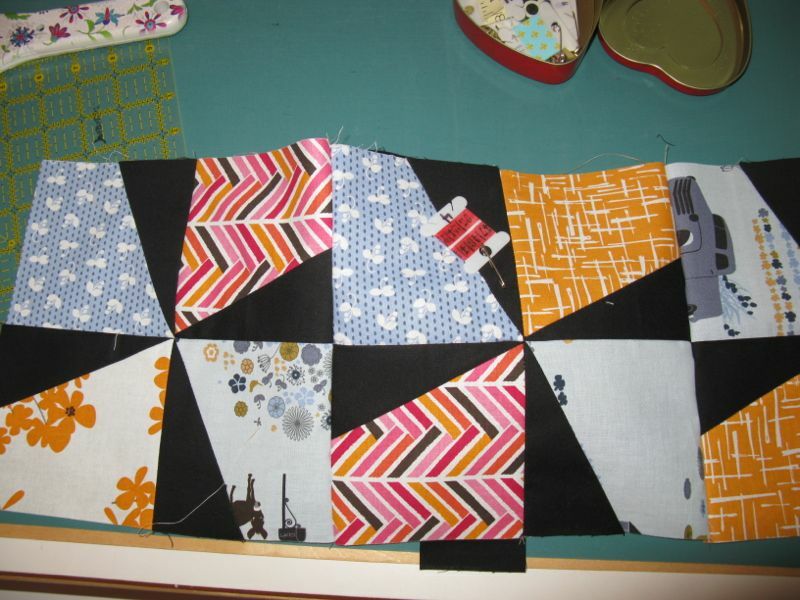 Sew that seam across the two blocks. I found that if I took the step of going to the ironing board to press toward the pinwheel, I could get away without pinning this thing to death, or eliminating the pins altogether. 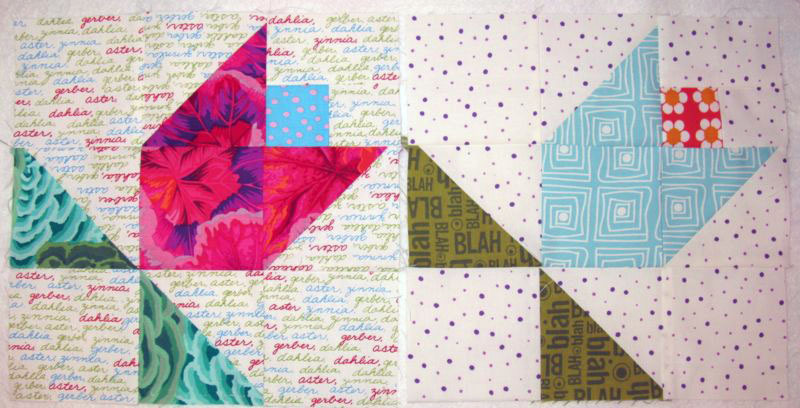 The block kind of fits together because of the directional pressing. It’s not perfect, though, so if you are all about perfection, get out the pins. 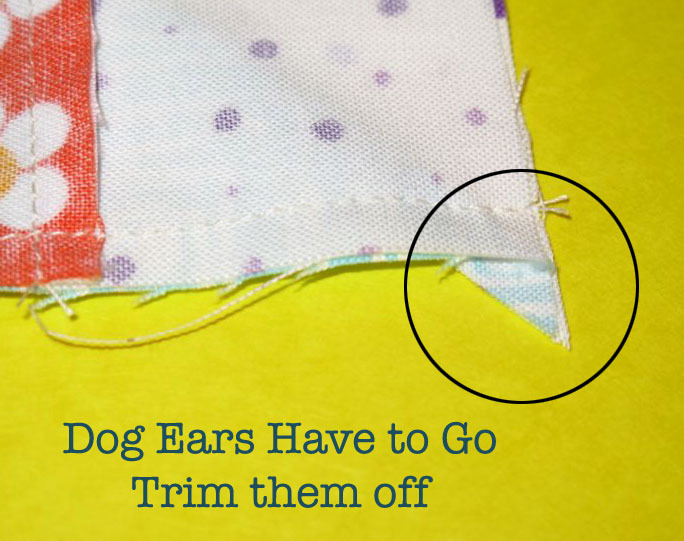 Head to the ironing board, and clip that little joining thread, and liberate any others that might keep you from opening up that center “flower” of seams. As you work with it, you’ll be able to figure out the tiny clips of threads here and there. 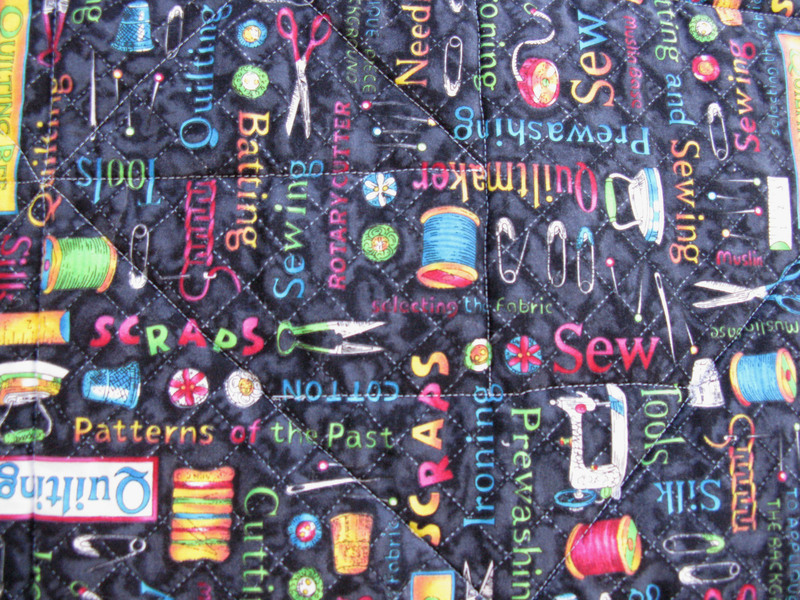 Don’t cut any of the fabric, please, just the seam-threads. 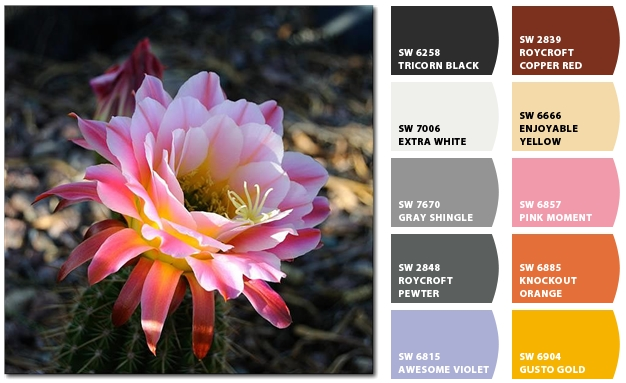 You want that center to lay down into a flower. 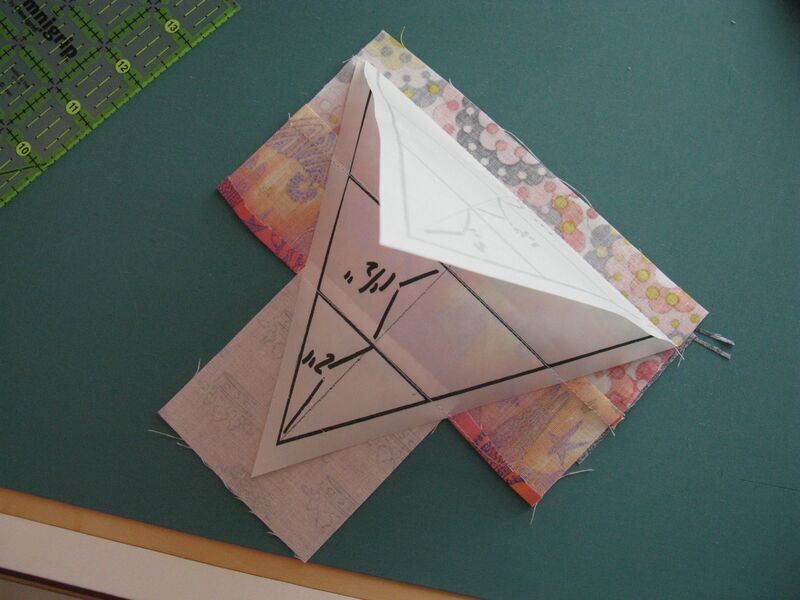 I put my thumb on the center, and applying pressure, give the whole thing a twist, flattening out the seams. Then press from the front. Even without using pins, I think that center join looks pretty good. Lay out your first row on your pin wall. 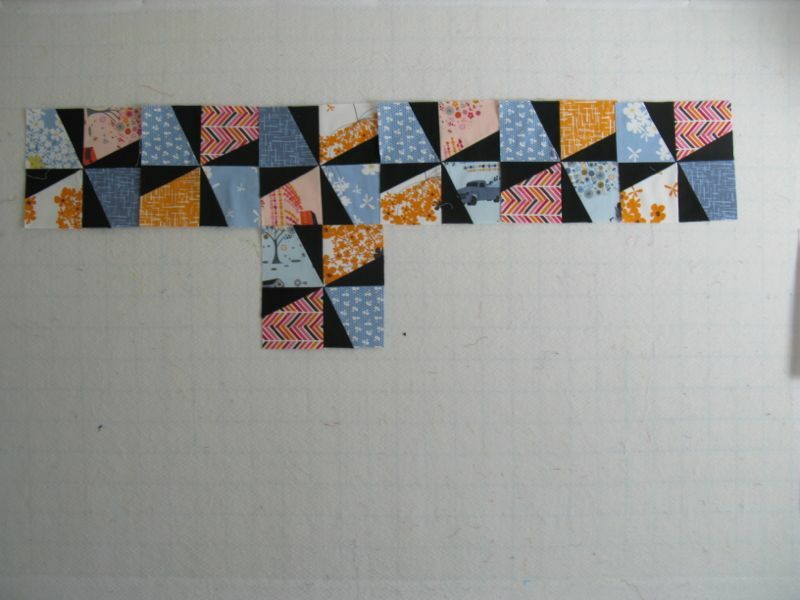 Then you want to add to it, lining up your blocks so there’s no obvious repeats or clashes. This part goes quickly. 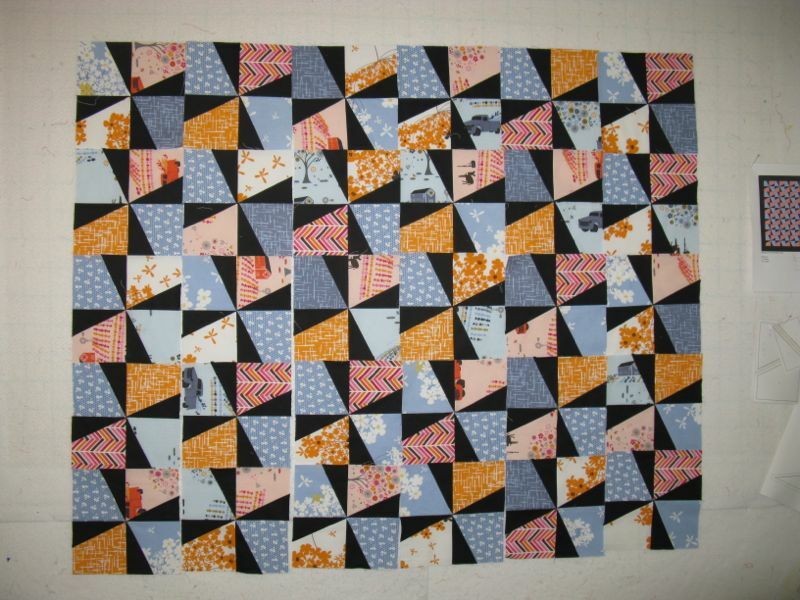 In fact, the whole quilt went quickly: one week from cutting to sewing on the borders. Stand back and see what is “clumping together” and needs to be separated, like squabbling children. I find taking photos helpful. The blocks I moved are not really noticeable, but calmed down the arrangement for me. Don’t fuss with this too much, just keep moving forward. 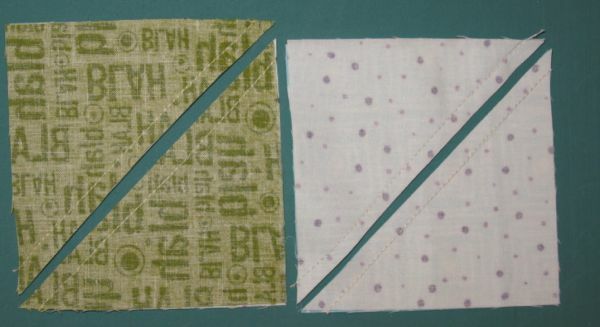 Use those nifty row markers to mark your rows and sew them together. 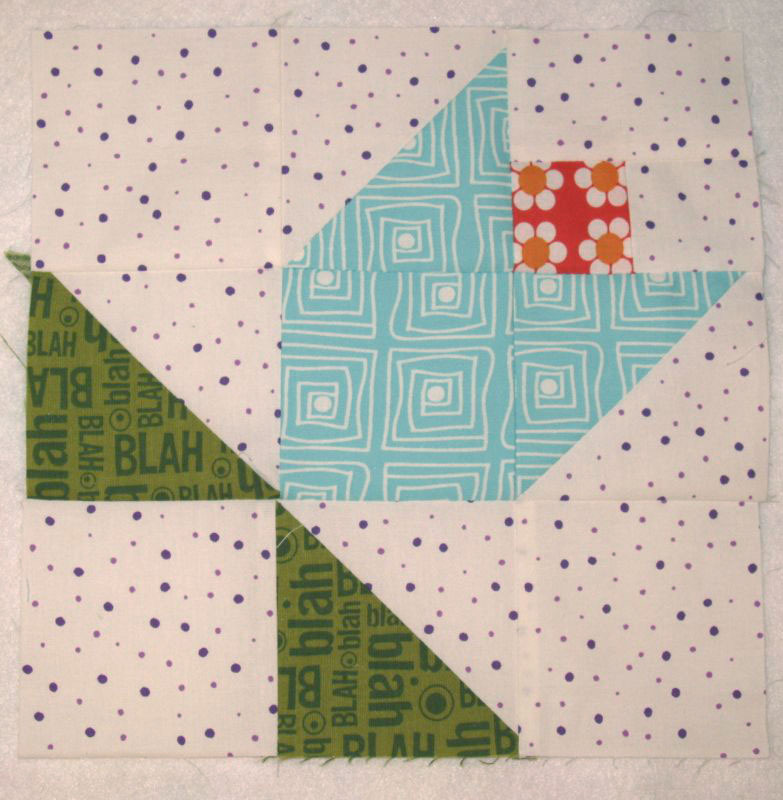 If you pay attention, you won’t sew a block on the WRONG end of the row, like I did up there on the left. Unpick. Re-sew. 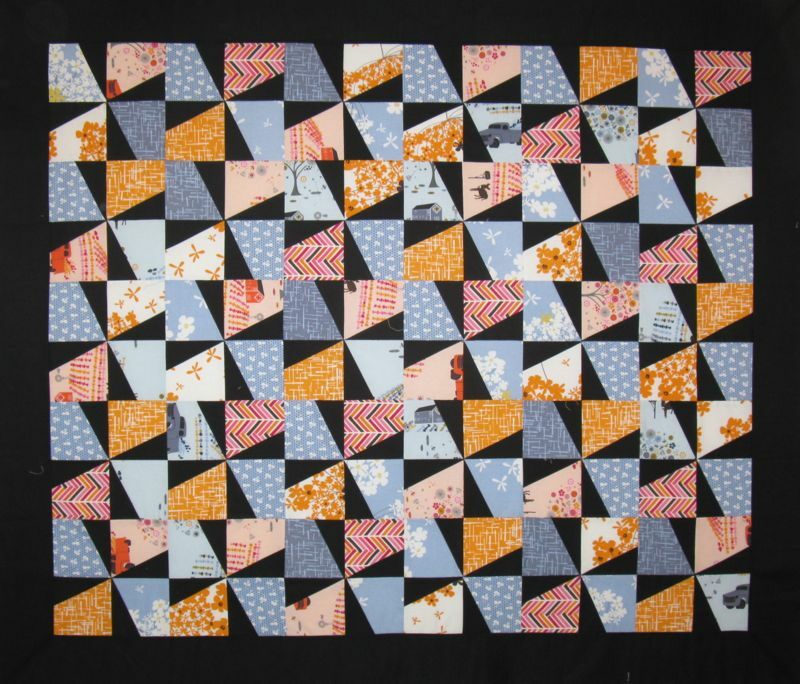 You’ve seen this before, but it’s really fun to show off a completed quilt top, isn’t it? Feeling blissful over here. 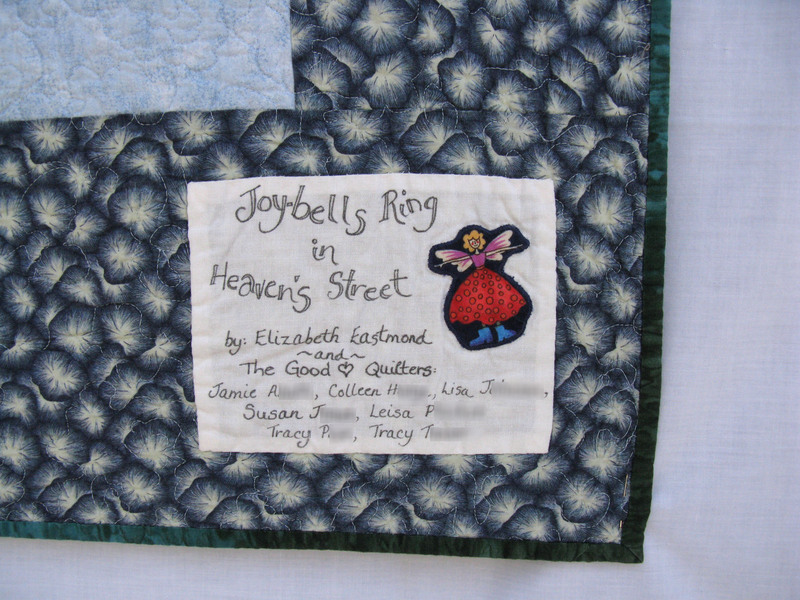 I’ve already pinned it to the backing, and after I finish grading their argument terms tests, making up the next essay assignment, writing the peer review for the current essay, creating the rubric for evaluating their rhetoric presentation, writing another blog post for the class, and calling my mother, I plan to start quilting it. 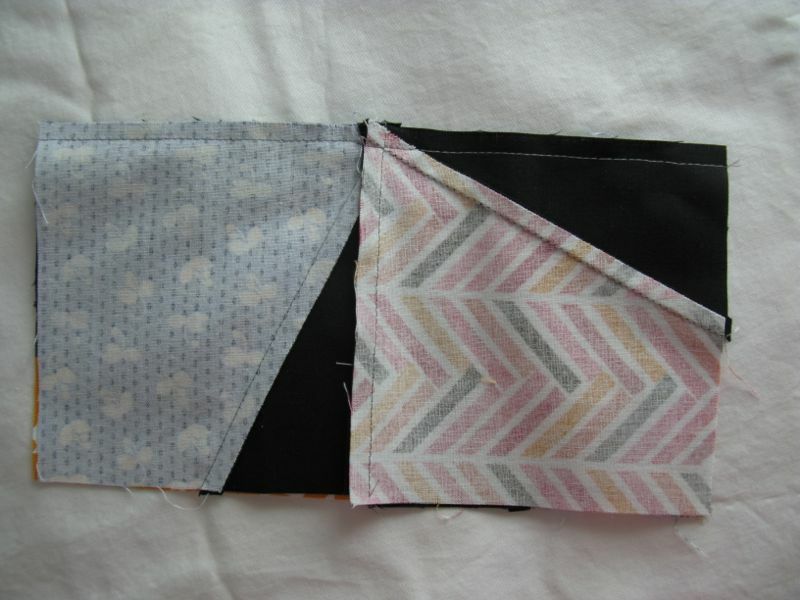 Posted on July 23, 2012 by Elizabeth E.
We had the common fabrics to use of the fairy print (on navy) and the pink striped (shown in some of the houses). 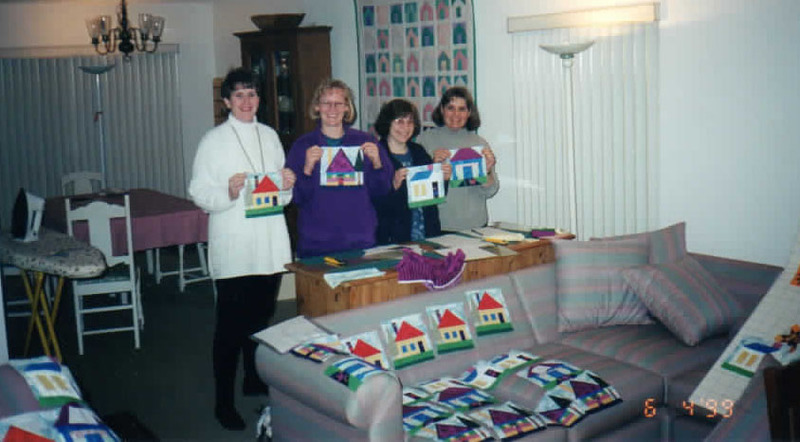 And here we are: Tracy, Lisa, Susan (who has moved away) and me, all holding up our quilt squares. I love how they are all laid around the sofa everywhere. 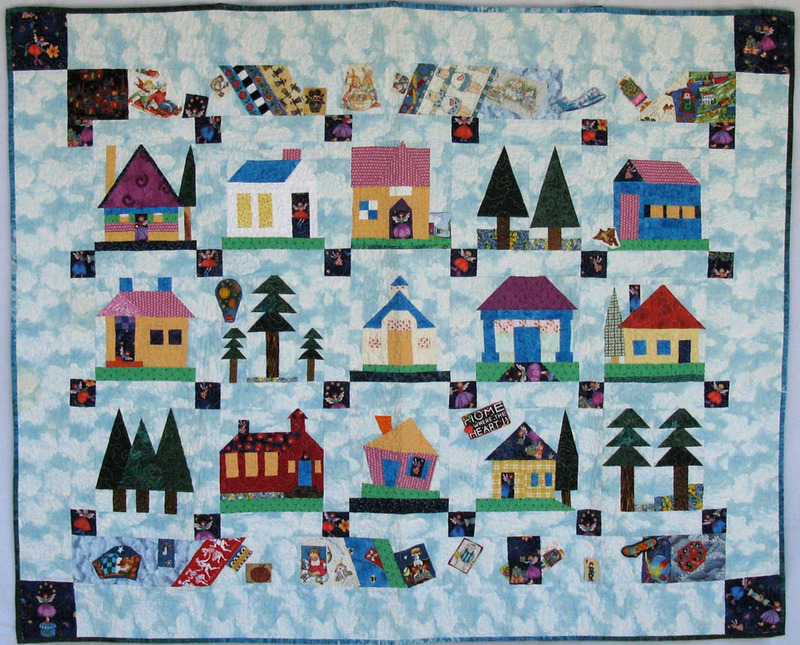 And I love seeing that houses quilt in the background (#14 on my 100 quilts list, made 10 years earlier in 1988). Detail. I wanted it to have bits and pieces of a neighborhood so I included those things in each deep border above and below the houses. I guess at the time it had significance, as I notice some World Wide Web fabric there (the earth globe above). The internet was just getting popular then — seems like a millenium ago. This one’s my house. I guess my fairy was tired and lay down on the front walkway. 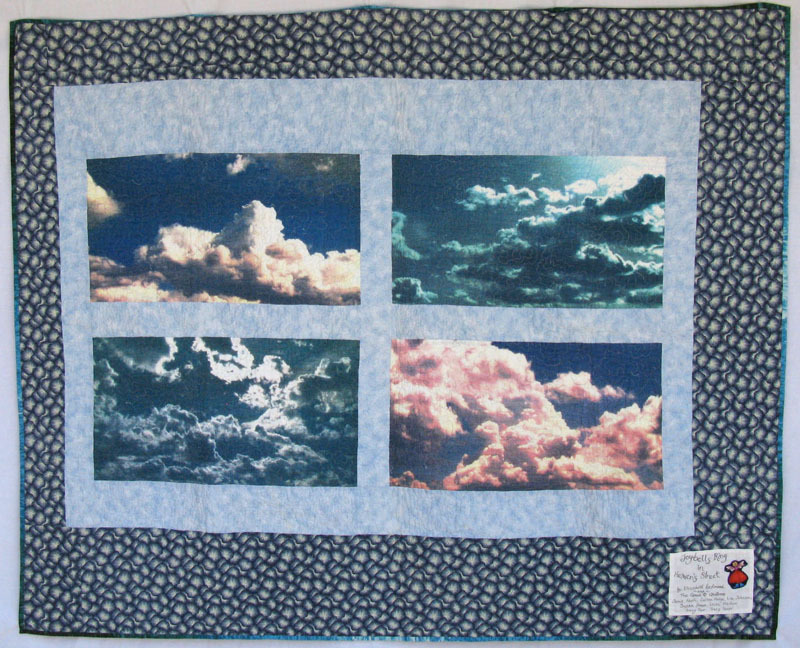 You know those things you buy at quilt shows, like the panel above. Whenever are you going to use them, if not for backs? 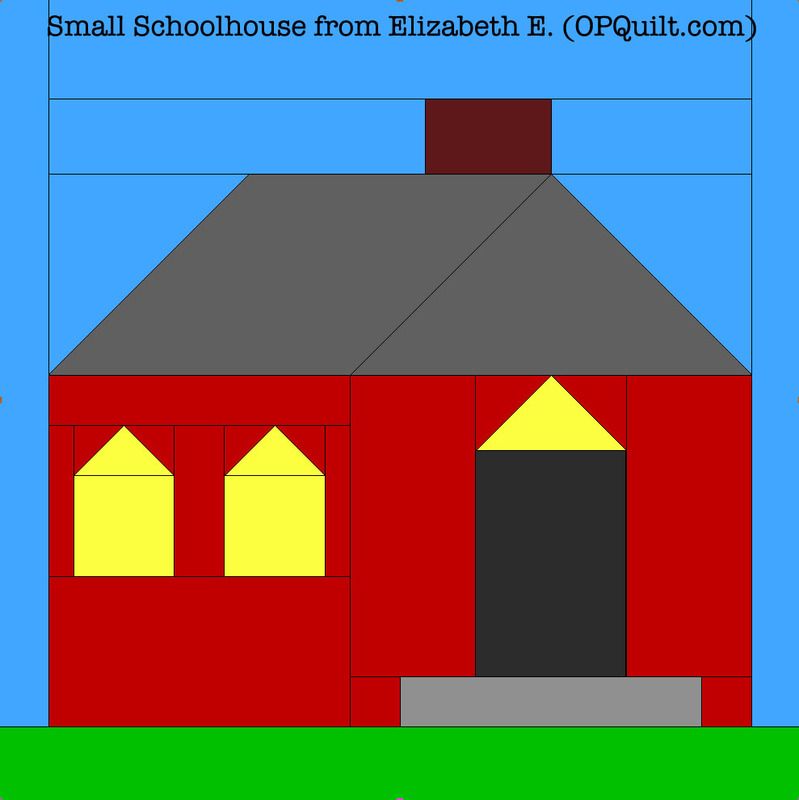 Okay, here’s a few of the houses. 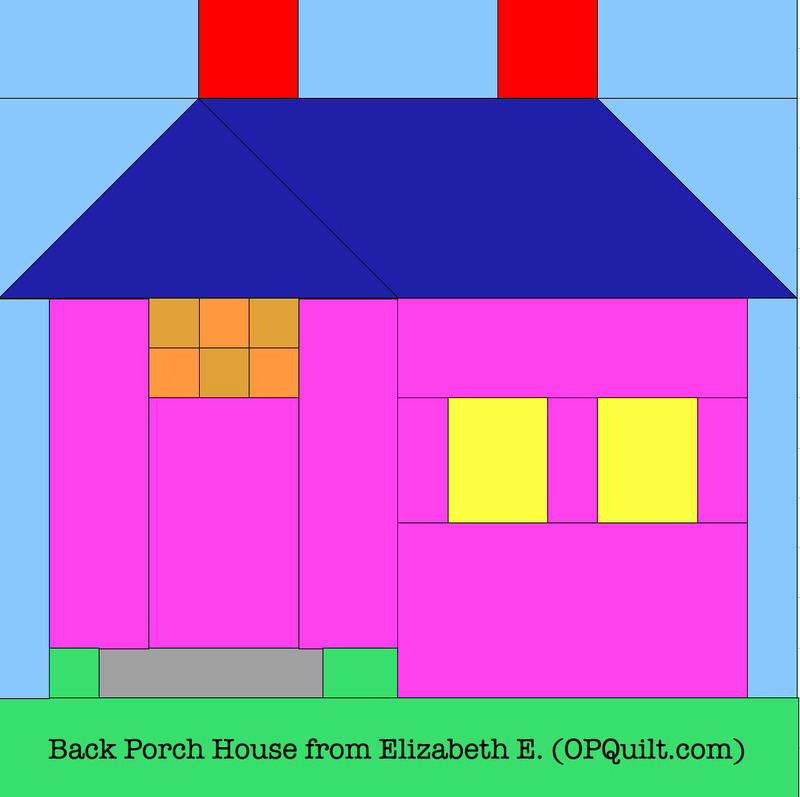 The links underneath each illustration are templates for each house. They are PDF download files, but I’d ask you to remember that since I was a novice at this software at that time, they aren’t perfect. Some have a lot of pieces, others are more streamlined. A mix is best, if you’re making a village. 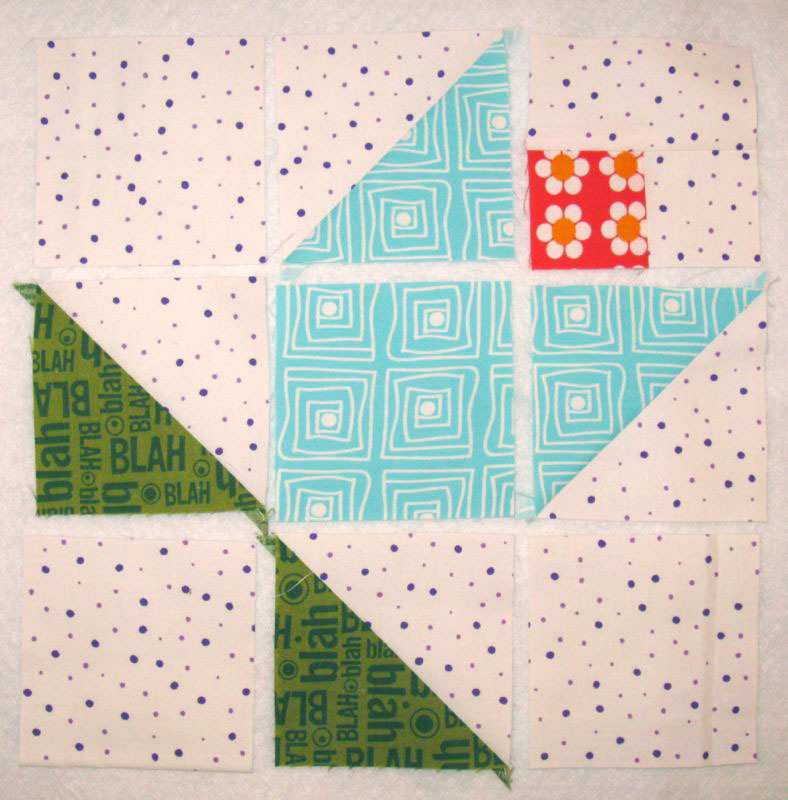 Posted on July 16, 2012 by Elizabeth E.
Krista received her Far Flung Bee Blocks, so now I can write about them. Like a pregnancy, I figure it’s not my news to tell, so I like to let them do the Woo-hoo! thing and then I’ll follow up. Since I’ve only done In-Real-Life Swaps, it’s probably all wrong, like when I sent in my Polaroids. . . Whoops, did it all wrong. She wanted a wonky house. 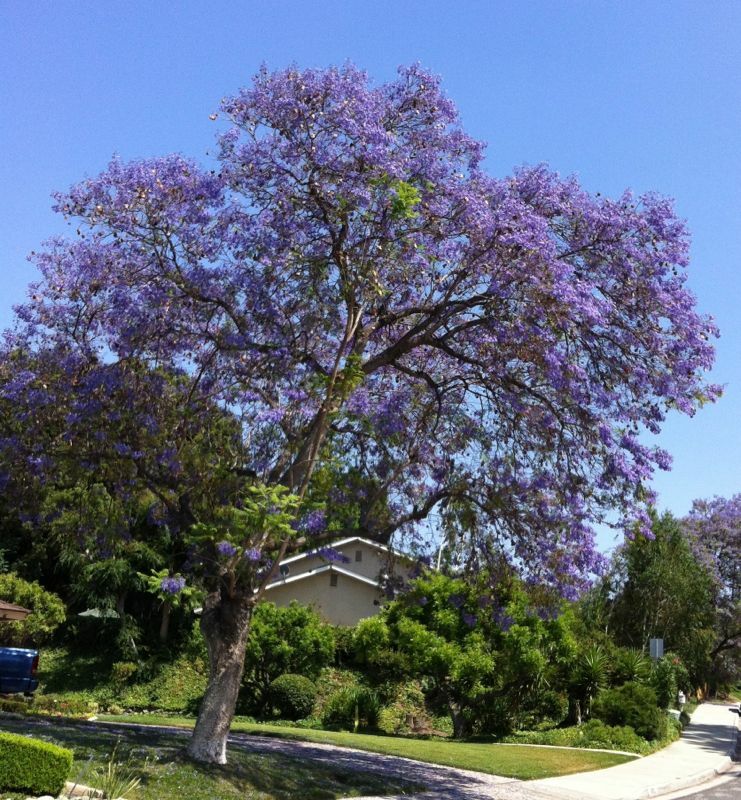 And trees, if you please. 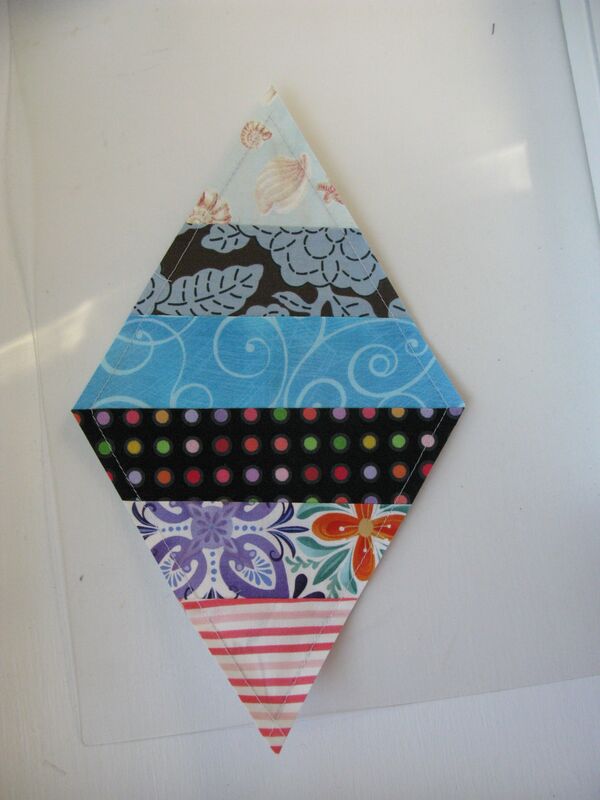 They show it for paper piecing, but no way was I going to do that. 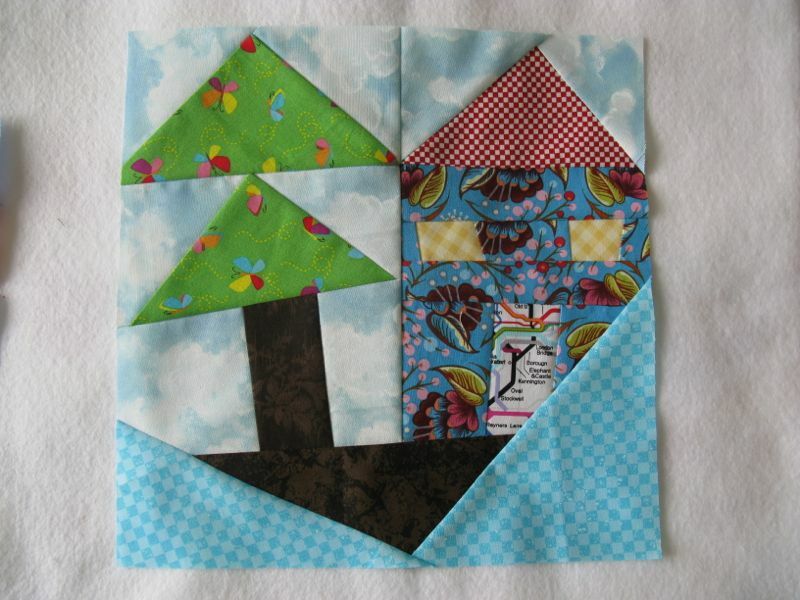 The blocks on my quilt are about 12″ on the short side because I wanted JUMBO houses in among my pine trees. 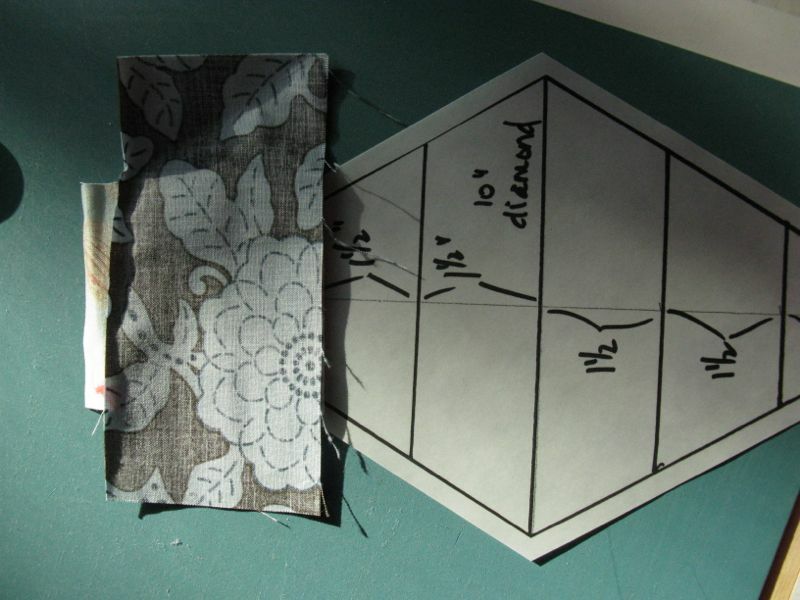 I took it to the local copy shop and blew up the PDF and taped the pattern pieces together. 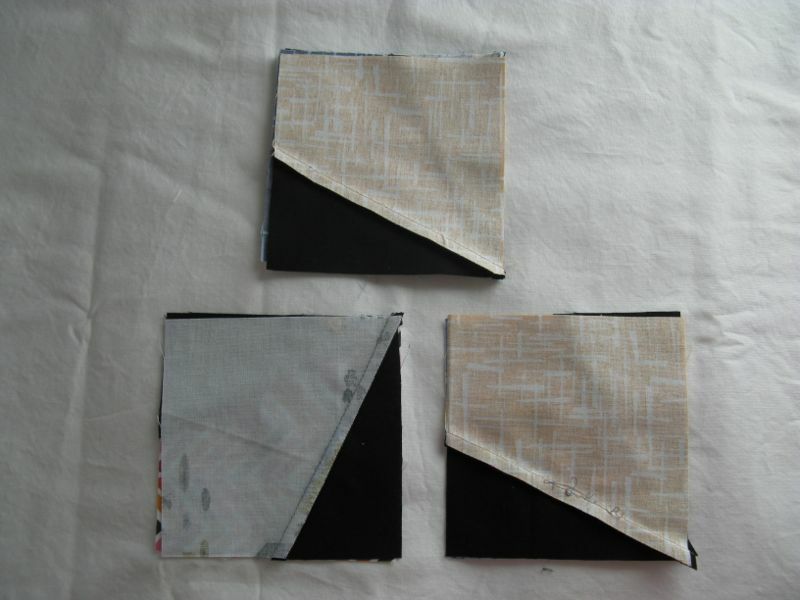 I just cut them out and use the pieces as a pattern, sometimes just measuring then cutting. 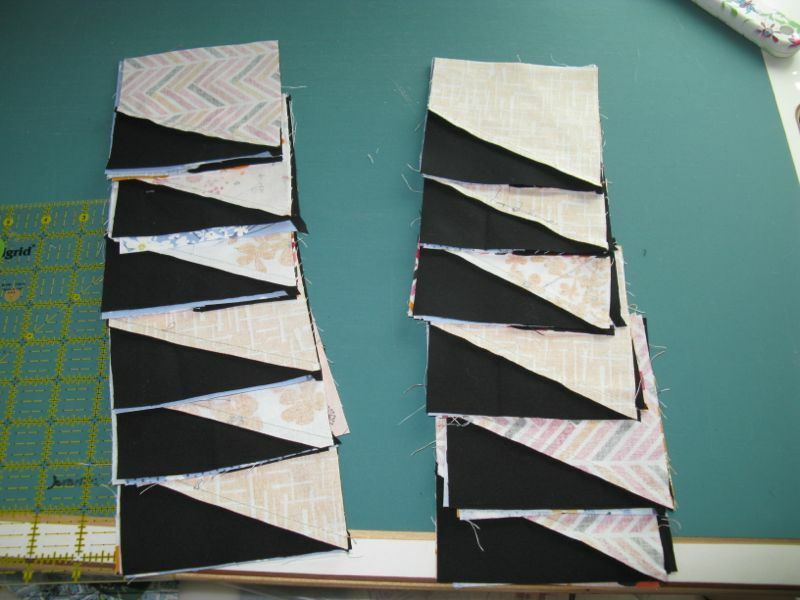 I made the long blocks for the border sort of randomly, first making the tree tops, then gauging how long those trunks needed to be to fit. 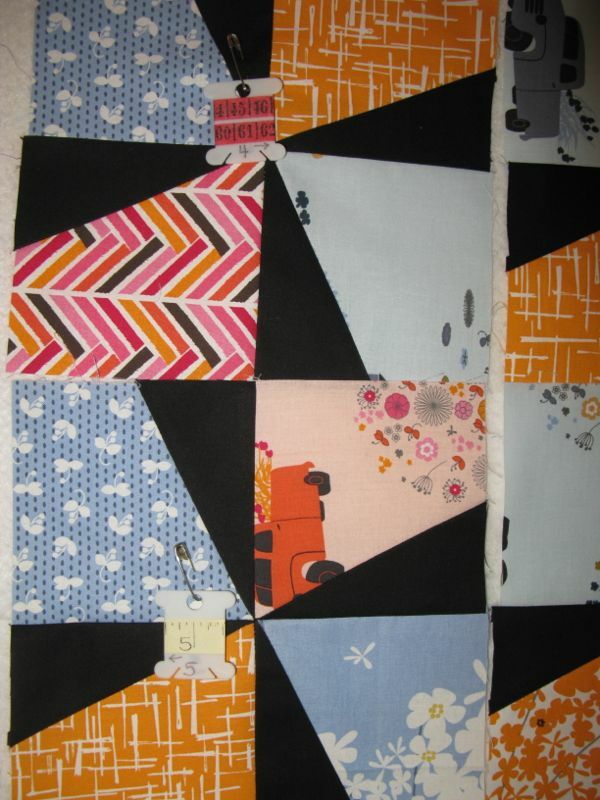 I backed it with some Mary Lou Weidman fabric. That was the year I was in charge of a camp for young women ages 12-18, which was held up in the pines in the San Bernardino forest near Big Bear Lake. It’s a LOT of work, and I was working with a camp director who I found out later was brilliant in working with recalcitrant teenagers, but not so brilliant in doing the grunt work that has to be done to get a camp organized. Her team was also untested, but were very strong-willed about what should and shouldn’t be done. I had been to a similar camp when I was a girl, had gone back as an adult counselor for several years, so I came at it from a different angle. Needless to say, that was a challenging spring as we tried to quash all our personality quirks in order to get the camp planned. And on top of all that, it was my only my third semester teaching at a community college, and they’d given me a new level of class to figure out, and I felt like I was nearly underwater all the time just on that issue. 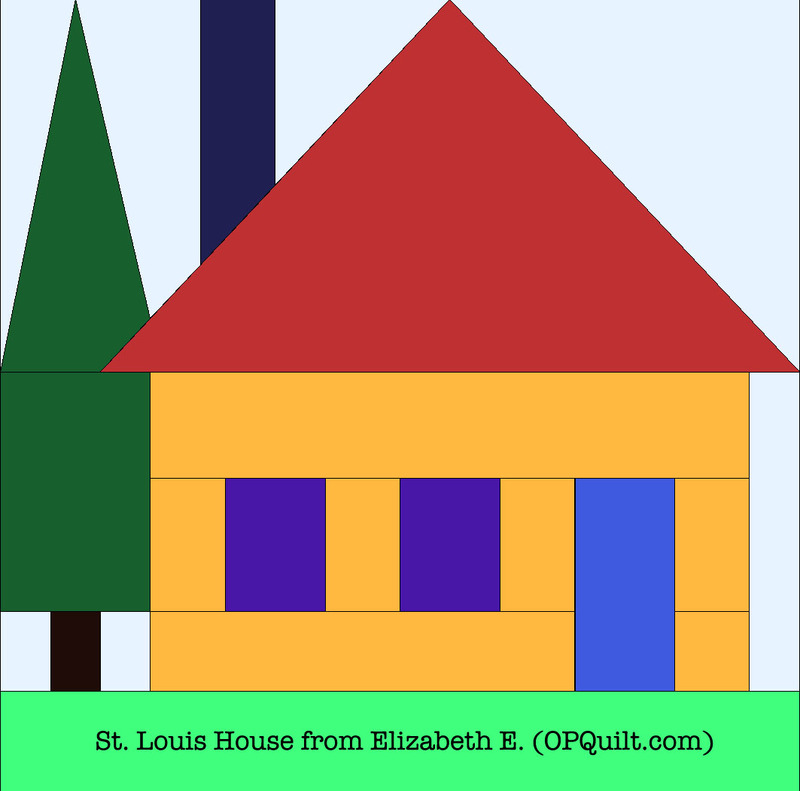 So, what else to quilters do? 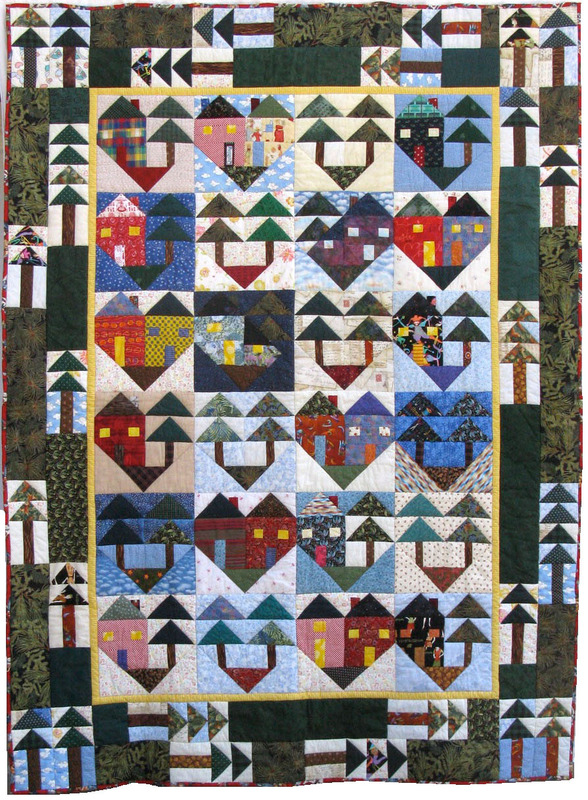 They make a quilt. I called this Hearts in the Pines. 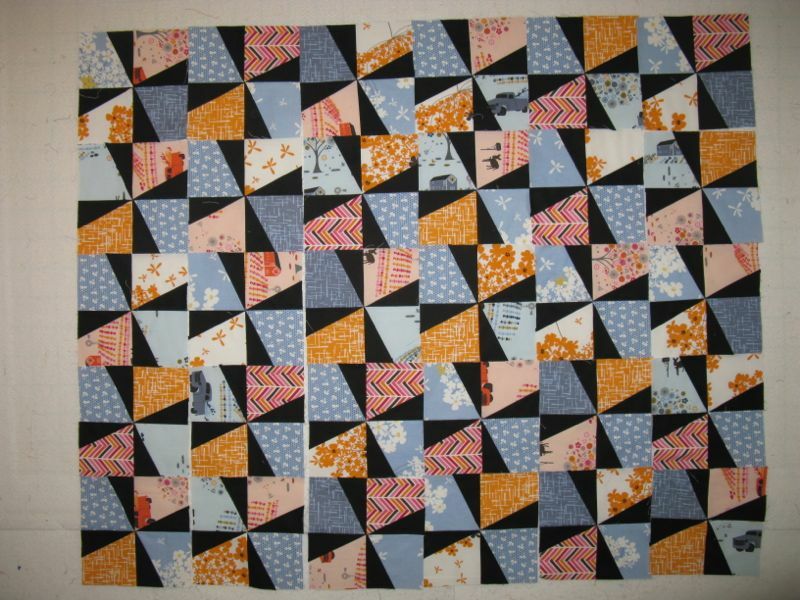 I finished the top and with only a few weeks to go, the semester ending, I called my quilter and she did stitch-in-the-ditch to stabilize the quilt. I stitched the binding on, but didn’t have time to sew it down. I took it to camp and in the few free minutes I had in between kitchen crises (oh, didn’t I tell you that two of the cooks backed out at the last minute and so I was in the kitchen too? 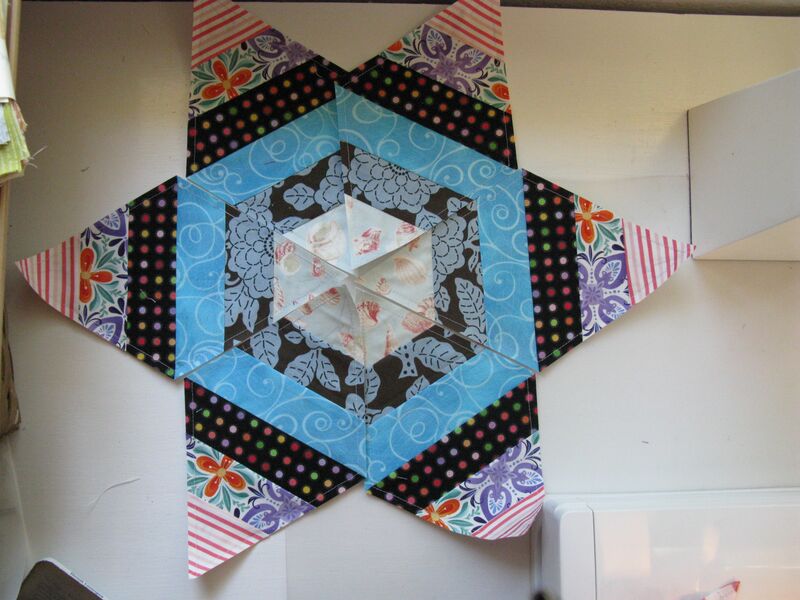 ), visiting with the girls, my husband (who I’d recruited to join me) and my angel daughter who drove in from Arizona with a friend to help her mom, I finished stitching around the quilt to get that binding on. 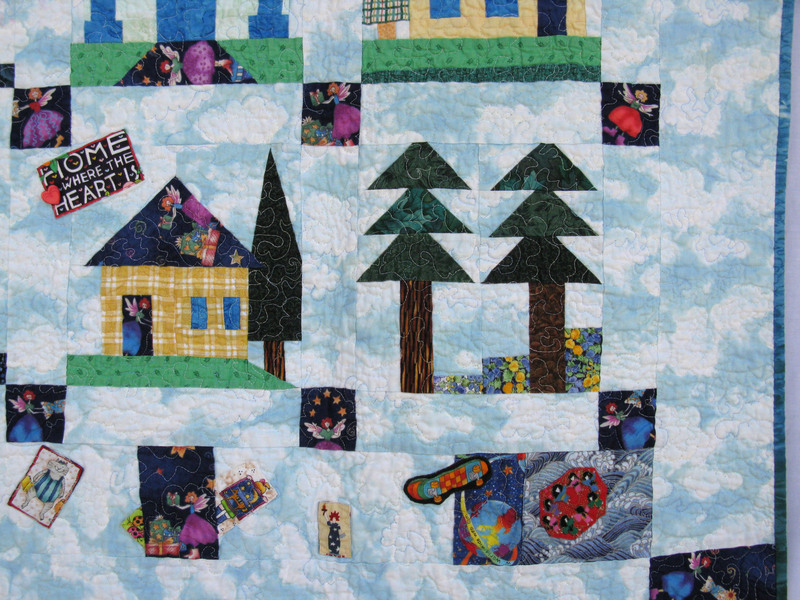 And much later, I finished the quilting around all the houses and trees. 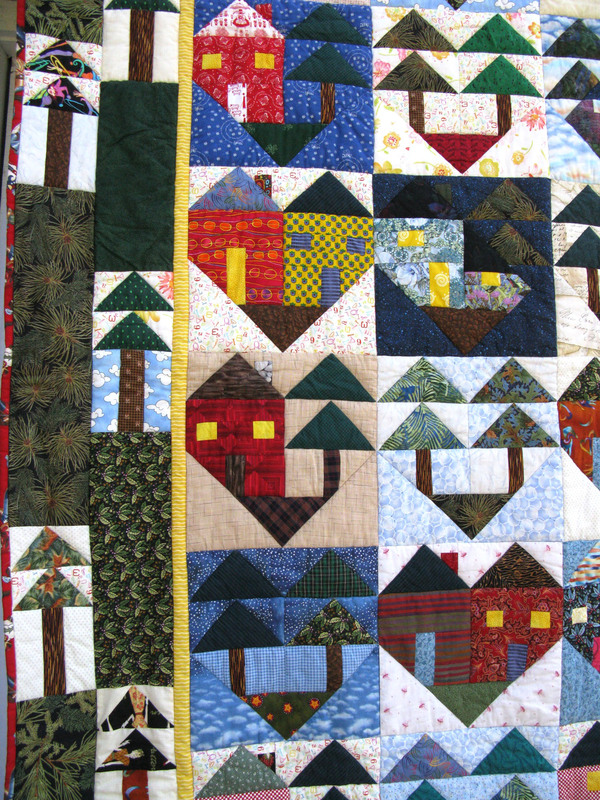 I always like how quilts have a story behind them. 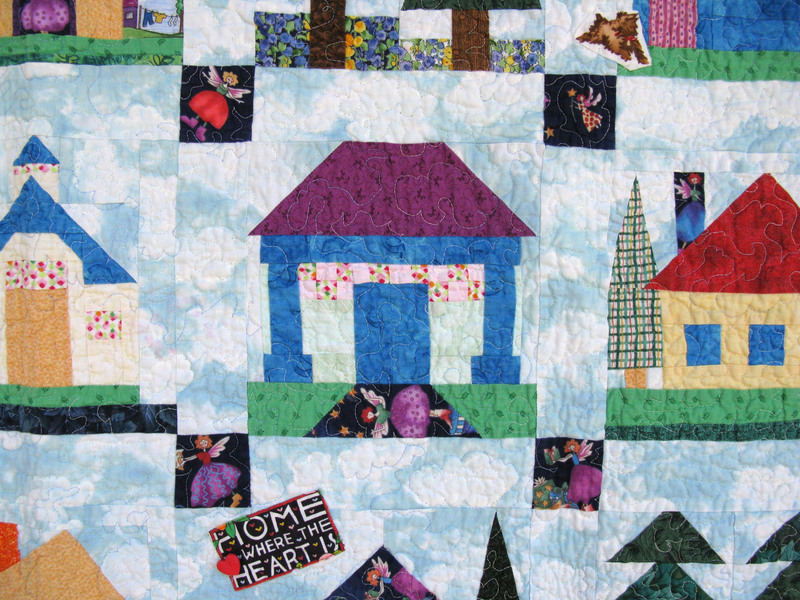 Whether it’s just one of those quick quilts that you throw together for a baby shower, or one that represents a time in your life, the story — I believe — makes the quilt. 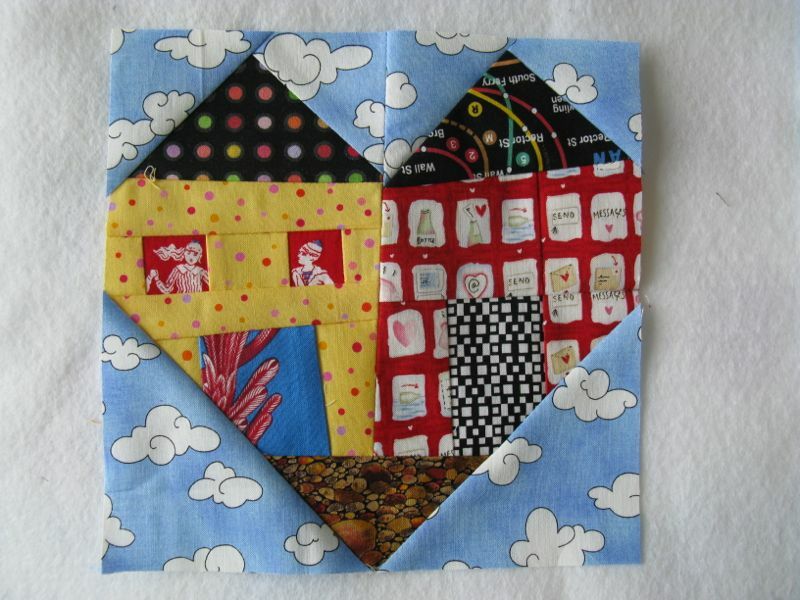 Just like Krista will hopefully remember the summer she was engaged, when she looks at the quilt she made from a few wonky heart blocks. Posted on February 26, 2012 by Elizabeth E.
I’ve been diving into scraps this week, as I had a couple of days all to myself. 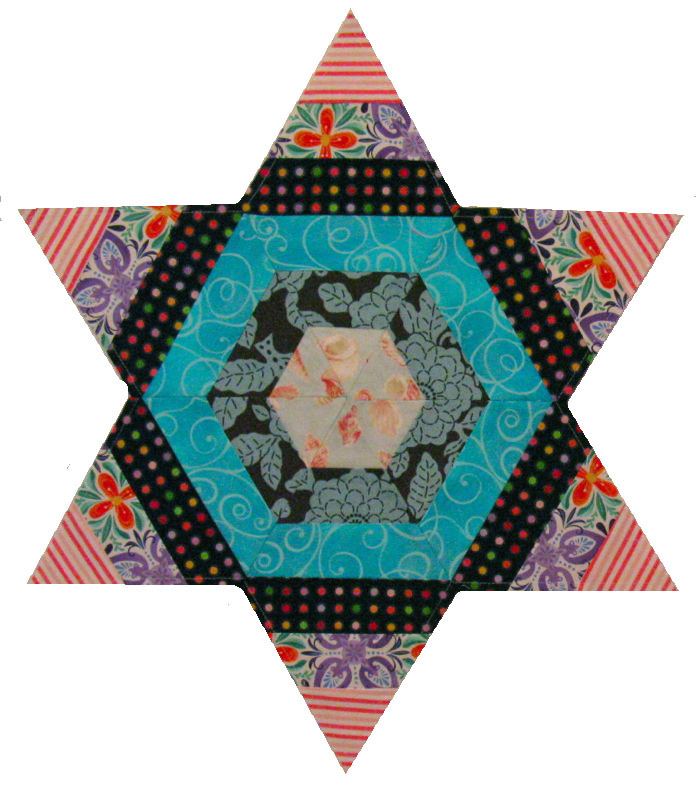 Inspired by a quilt I saw in the Scrap Attack Flickr group, a scrappy star by Svetlana of s.o.t.a.k homemade, I decided to try it myself. 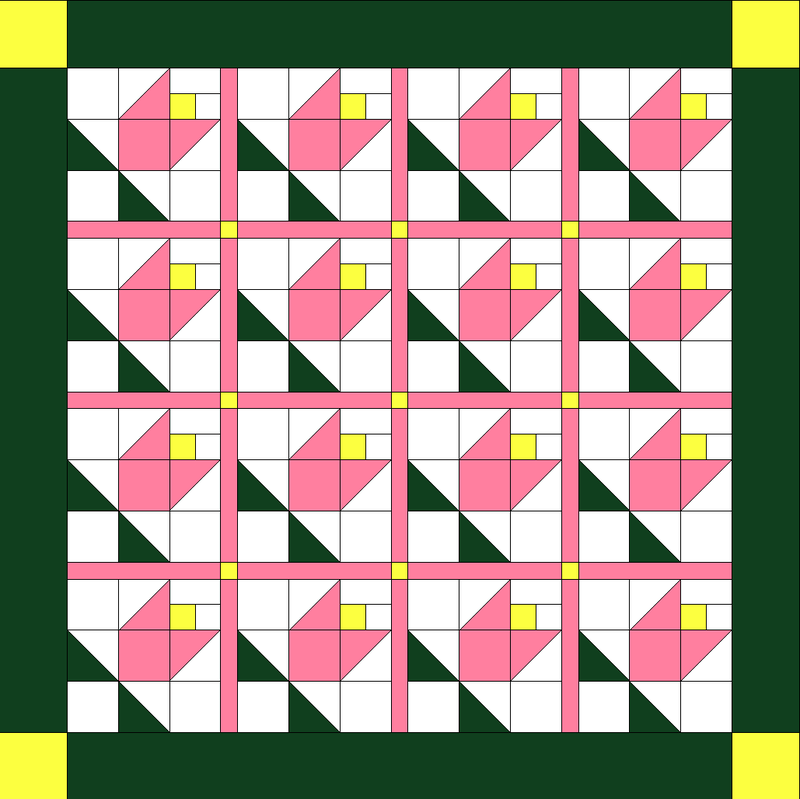 It looked similar to lots of spiderweb blocks found in many traditional blocks, some published ages and ages ago, I thought I might be able to draw on my years of quilting and put it together myself. 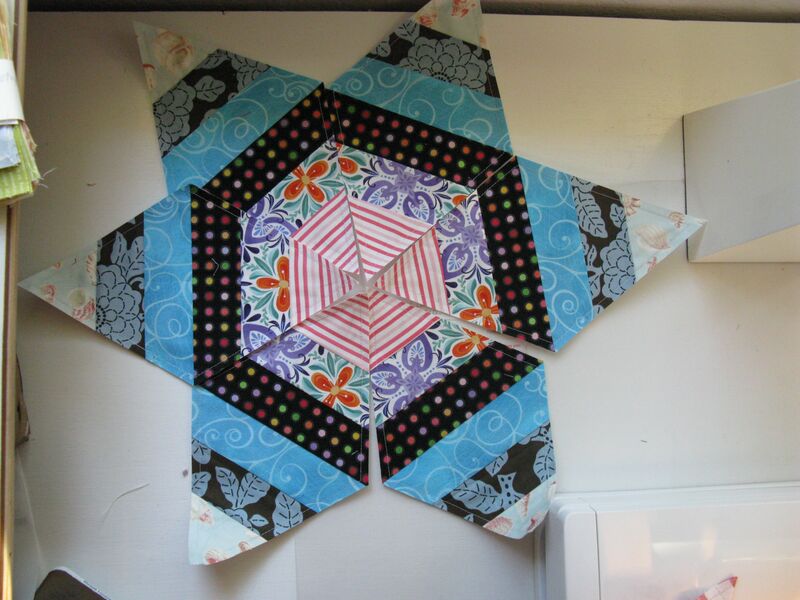 First, download my scrappy stars paper piecing template by clicking on the link (NOT the picture). It should measure 10 inches from tip to tip when you print it out. 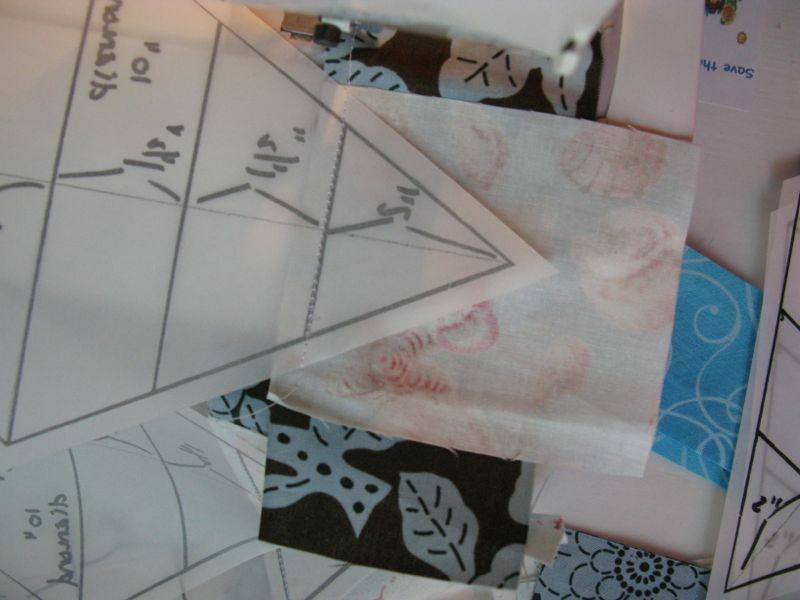 A tip I learned from Becky Goldsmith is to print out your paper piecing templates on vellum paper. I bought a package some time ago from my local paper store, so I went to the copy center and printed ONE copy of the diamond. Then I pulled the original off the platen glass and checked it for size. Yep. Same size. I wanted to make about eight stars (and there are six diamonds in each star), so I printed off 60 copies — about ten more diamonds than I needed, just in case. Okay, so PANIC! When starting a new process or project, I can feel overwhelmed by it all. 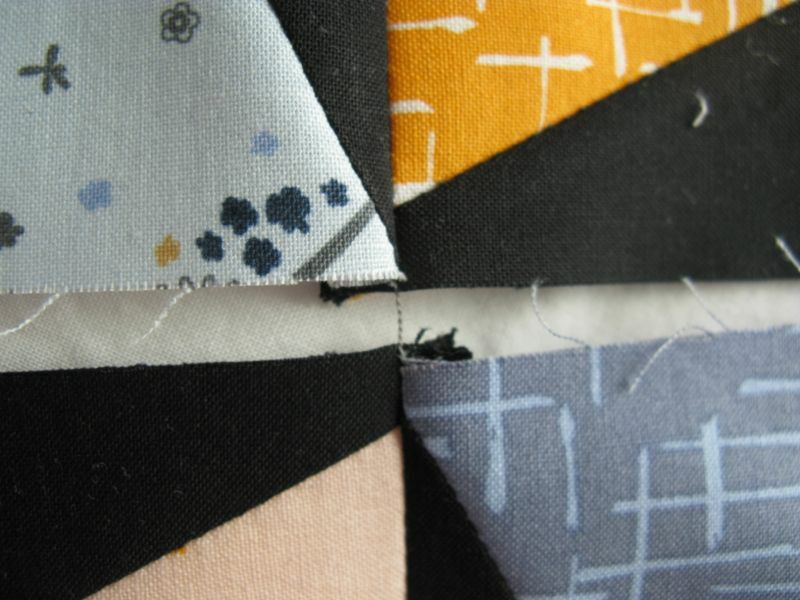 But then I said to myself, just choose six fabrics that go somewhat together, in fact the less they go together the better it will be. That’s all, then you can take it from there. 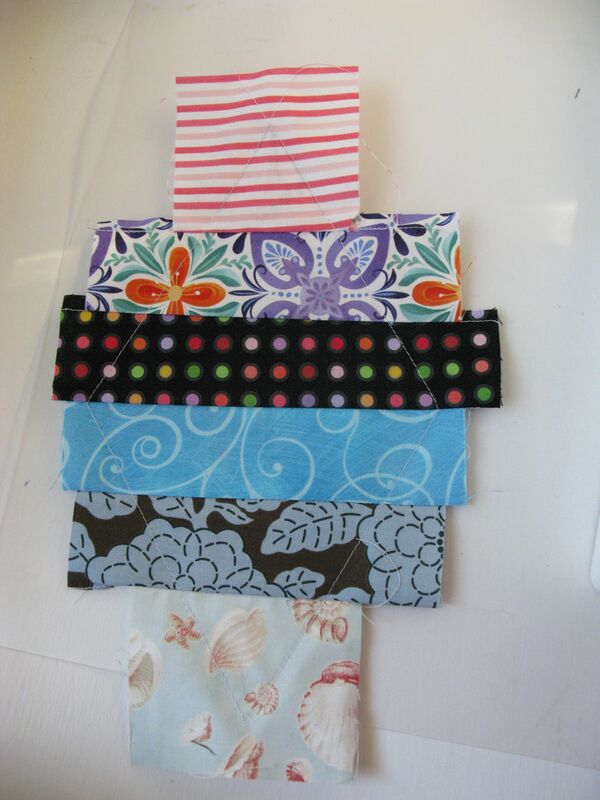 I chose fabrics, laid them out, liked them. 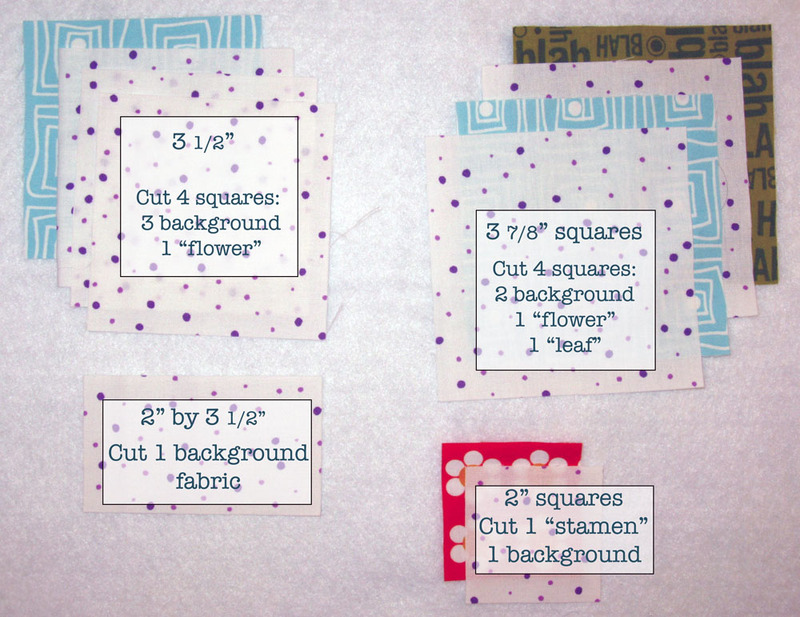 I cut 3″ squares for the two tips, then I cut the rests of the strips 2 1/2 inches wide by 6 1/2″ long. Yes, I know that’s way wide, but I liked some squoosh room when working with them. Line up two at first, peeking through the parchment template to line them up straight. Stitch on the line. 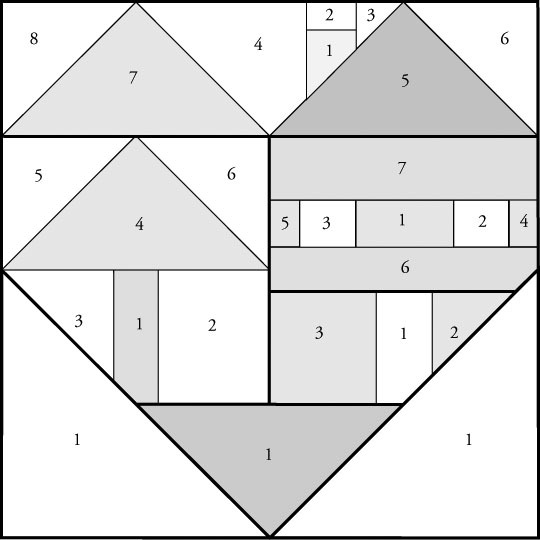 If you are not familiar with the technique, there are several YouTube videos (just google “paper piecing”). I don’t trim up the sides yet. 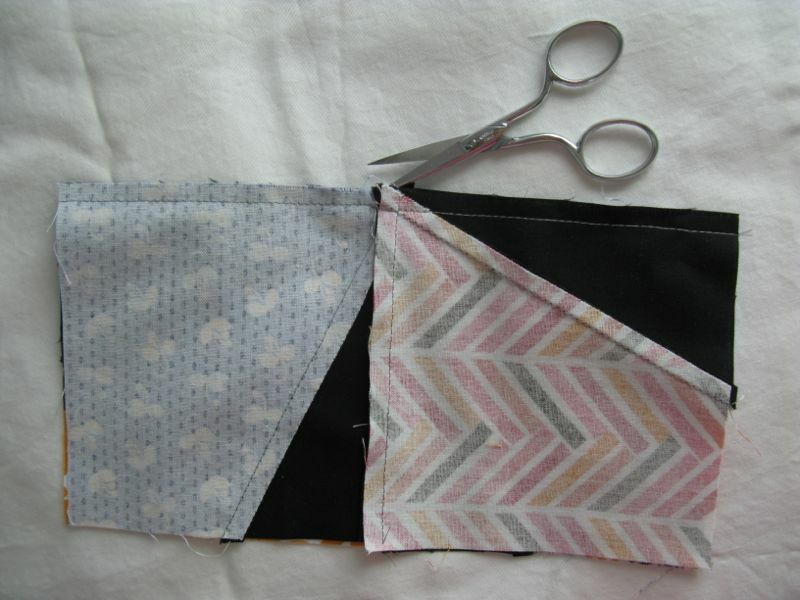 As you progress, you’ll need to trim off the excess in between your seaming. 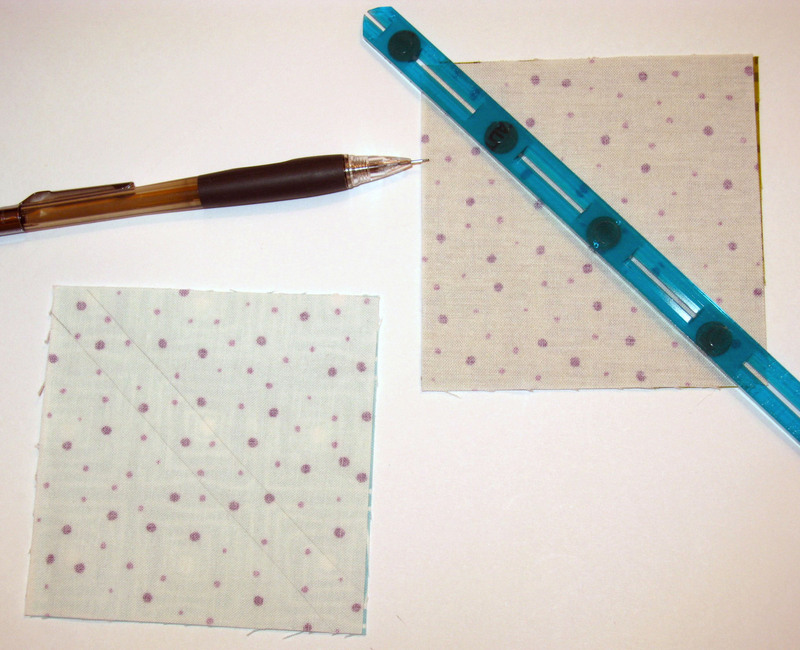 Lay it out flat on your cutting surface, and crease back the template on the stitching line, making a nice crisp crease. This also helps when you rip that paper off, later. Line up the ruler, slice off the extra. Iron the fabric down into place, then keep going until you fill up your diamond. 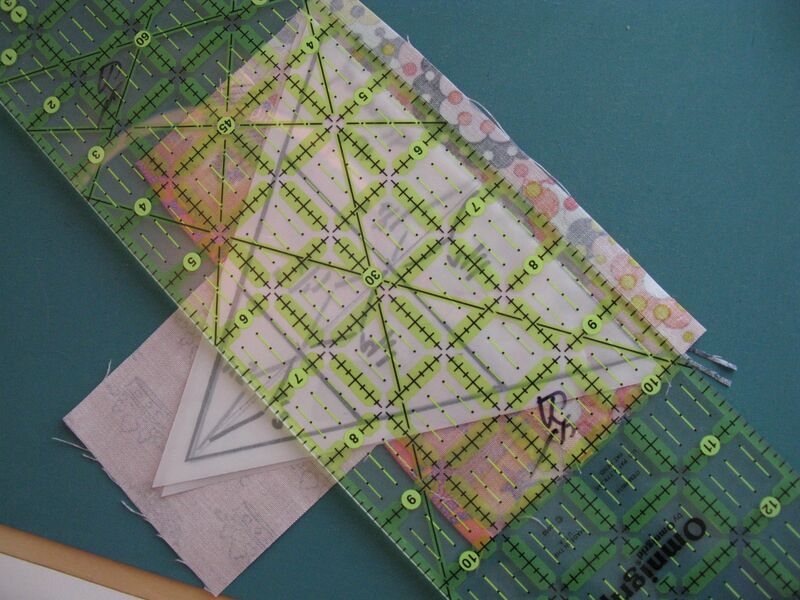 From the paper side, use the marking to stitch around the outside edge. 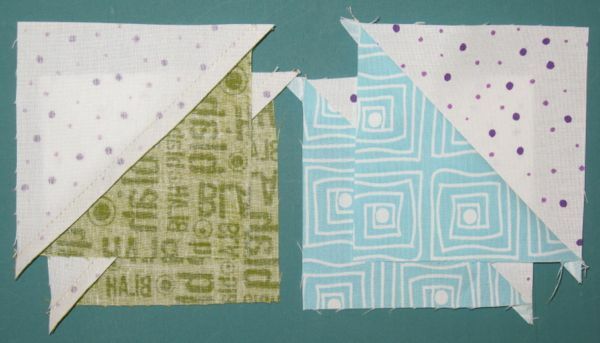 Since you are using scraps, some may be off-grain and this stay-stitching helps stabilize that outside edge. Trim. It looks sooo pretty now, but now comes the real fun! Lay them all out. * Smile. * Since you are working in such a large scale (20 inches from tip to tip), that star really makes an impact. Or do I like it this way? Flipping them around creates a totally different look. 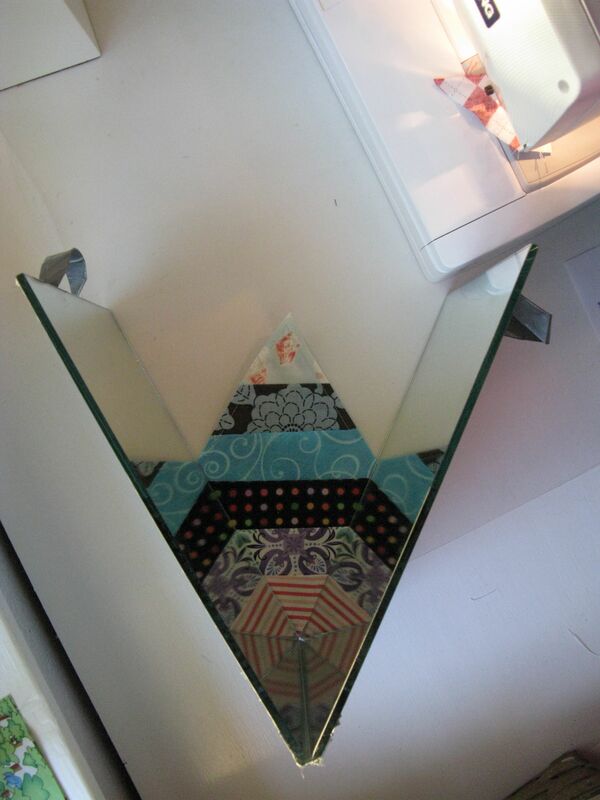 I have this clever device: a hinged mirror. 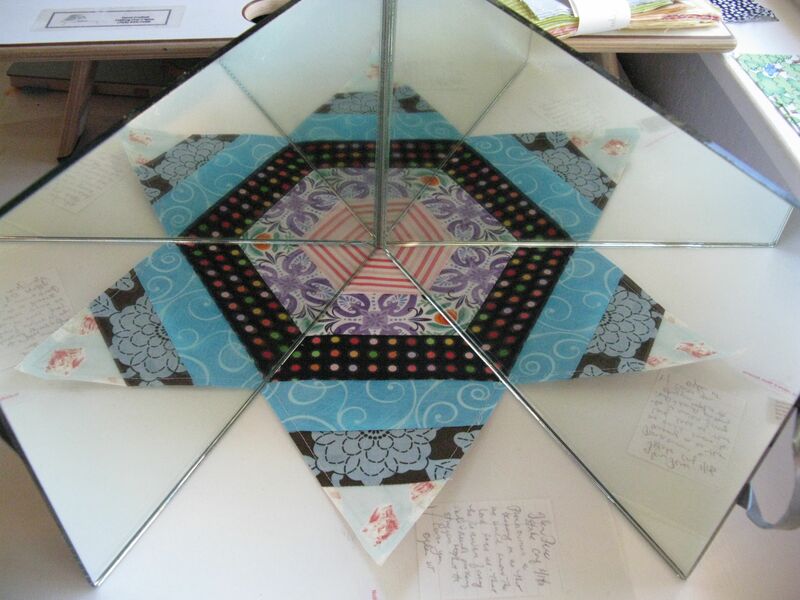 I place ONE diamond, set the edges of the mirror on it, and voila! My block, in reflection. This is what it looks like from the top, sitting on top of one diamond. Check back Tuesday for how I put the pieces together. AND. . .Don’t forget to come back on Wednesday for our thread giveaway. We have ten different bloggers participating in the Leap Day Superior Thread Giveaway.